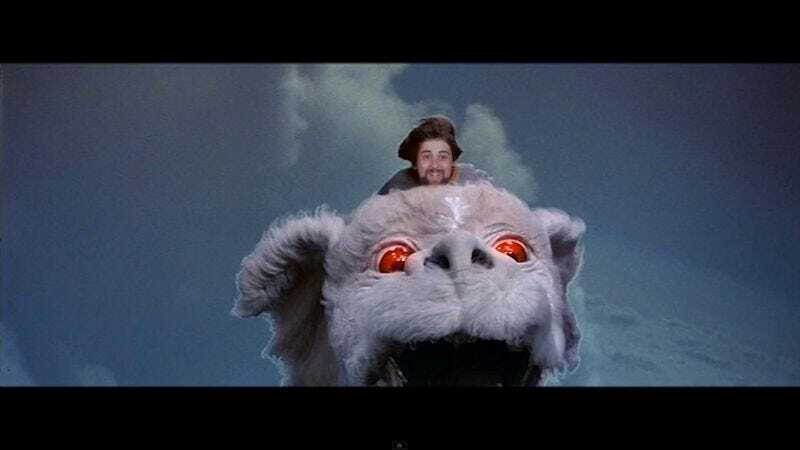 For many indoor kids, it was easy to relate to Sebastian in 1984’s The NeverEnding Story. An anxious nerd who was more interested in the fantasy realms of his books than the unforgiving pitfalls of socializing, audiences could live vicariously through this child (who, in turn, was living vicariously through the adventures of the brave warrior Atreyu). So it makes sense that, 30 years later, one of those kids has grown up and literally put himself into Bastian’s place. The music video for Dum’s song “On & On” puts the adult faces of the band onto the child actors’ heads for a result that is both pretty amusing and more than a little creepy. Luckily Dum reduced the amount of terror by not including any footage from the Gmork scene. The poppy song works well with the ‘80s escapist imagery despite using a film where a child grieves his dead mother through reading an allegory about the encroaching void that is adulthood and one’s own mortality. Dum makes a few other tweaks and changes to the footage, but mostly it’s the image of the bearded manchild who really loves reading that will haunt viewers’ nightmares.